Posted on Sun, Sep 6, 2009 : 5:59 a.m. Call it the University of Michigan’s $108 million transformation. U-M’s acquisition of Pfizer’s 30-building, 173.5-acre former campus in northern Ann Arbor - a deal completed in mid-June - marks a transition of massive proportions. University leaders will shape the site’s future this fall after several committees involving some 200 university officials and Ann Arbor business leaders deliver a series of recommendations for the research campus. Based on the recommendations that will be finalized in coming weeks, workers could begin moving into ex-Pfizer space by January. University officials emphasize that the transition - focusing on expanding research opportunities - would be deliberate and methodical, not rushed. Stephen Forrest, U-M’s vice president for research and chairman of Ann Arbor SPARK, said the university’s acquisition of the ex-Pfizer site marks an unprecedented opportunity. “It’s truly a watershed moment in the university’s history - probably the biggest event in 50 or maybe 100 years,” he said in an interview at the ex-Pfizer site. But Forrest also argued that the site’s transition could prove to be an economic turning point for the area. â€¢ Jobs: The university expects to add 2,000 to 3,000 jobs over the next 10 years to populate the site, which has been renamed U-M North Campus Research Complex. nanotechnology. The new site is likely to encourage new types of collaborations and open research environments that produce innovation. â€¢ Business engagement: Companies that spin out of the university may get incubator space at the university, officials indicated. The university wants to engage other industrial partners in expanded collaborative research and commercialization opportunities. â€¢ Redevelopment opportunities: The site includes a 29-acre swath of undeveloped land on Plymouth Road. Forrest said “nobody’s given hardly any thought” yet on how to approach that land. 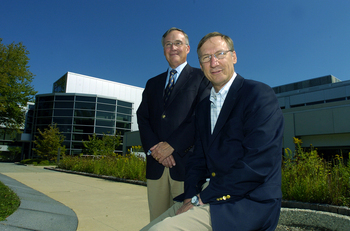 The site’s future became clouded when Pfizer announced in January 2007 that it would abandon the campus by the end of 2008, displacing more than 2,100 workers. The company’s slow exodus from Ann Arbor - its last workers left in October 2008 - coincided with the onset of the global financial crisis, which virtually eliminated interested real estate developers or pharmaceutical companies from acquiring the site. U-M, flush with cash, seized the site at a discounted price that MichBio executive director Stephen Rapundalo has estimated at more than 85 percent below the typical rate for similar property. The deal gives U-M instant access to office space and labs, but Medical School Dean James Woolliscroft, who is overseeing the transition, said the university is sticking by its initial plan of deciding what to do with the property over a period of 12 to 18 months. Contact AnnArbor.com’s Nathan Bomey at nathanbomey@annarbor.com or (734) 623-2587 or follow him on Twitter. Thu, Aug 25, 2011 : 6:06 p.m. Installing ground mount solar on the former Pfizer poperty is a waste of valuable green space. Wouldn't utilization of all the flat roof areas of the existing buildings be a better alternative and more environmentally friendly? Fri, Sep 11, 2009 : 7:46 p.m. The University of Michigan and the city of Ann Arbor need each other. Rather than point fingers and complain about each other, we should focus on working together for the common goal of having a vibrant and successful community. I feel so privileged to live near this vibrant and attractive small city. Fri, Sep 11, 2009 : 8:31 a.m.
Fri, Sep 11, 2009 : 7:51 a.m. Didn't U of M just build that huge Life Sciences building a few years ago? How much did that cost? And is it even fully utilized? I was under the impression that there was a lot of excess capacity there, but my info could be outdated. Does anyone have details on those two issues -- the cost and the utilization? Wed, Sep 9, 2009 : 10:54 a.m. I am aware of that story, as it provided a very general overview and lack insight into the details and potental impact of the University's actions. The story overall did not provide critical analysis of the University's plans, the economic and socail impact, both short and long term, that the loss in tax revenue and occupied commercial space will have let alone the impact on the city, schools, and public services. Wed, Sep 9, 2009 : 9:45 a.m. Wed, Sep 9, 2009 : 9:32 a.m. Despite all claims, the University is essentially an economic being that looks to act in its own interest. Little mention was made here about its plans to move much of its leased space into the Pizer facility and the impact that will have on the local economy by along with the loss in property tax revenue. Being hopeful is nice but for the tax payers of the city that already underwrite many of the Universitys projects several years is a long time to wait for the very intangible benefit of hope. Mon, Sep 7, 2009 : 5:47 p.m. The term Flush with cash is misleading: it has reserves due to a very conservative and long-term fiscal planning structure. This is an expense that has been properly planned for and does not jeopardize the future stability of the University with debt. At least this is how the structure has been explained to me as a regular employee. I am not in a position where I need / care to know any of the details. Also, if I am reading craig11152s comment correctly he seems to be under the impression that the University purchased Pfizer the pharmaceutical company. It purchased the property that Pfizer pulled its operations out of, it did not purchase Pfizer. Sun, Sep 6, 2009 : 5:06 p.m. The city will never recover from this. Sun, Sep 6, 2009 : 3:01 p.m.
Look at that!!! Finally, the northestside isn't completely destroyed!!! Sun, Sep 6, 2009 : 8:49 a.m. I just want to know if they're going to be keeping the Egg Sculpture or if I can acquire it somehow! Sun, Sep 6, 2009 : 7:48 a.m.
Sun, Sep 6, 2009 : 7:16 a.m.
Let us not forget that the people of the State of Michigan own the University. So we, the people of the state of Michigan now, for better or worse own Pfizer. It is always my hope that University officials who make the decisions never forget they are not a private corporation. I always hope they do not lose site of who's money they are spending. Sadly The quotes I read from these folks in story after story seem to suggest otherwise. Sun, Sep 6, 2009 : 6:30 a.m.
How did the U become so "flush with cash", as the article states, that it could buy this property off the shelf?I thought there were serious financial pressures on most sectors of the U, including the Health System, to the point that budget cuts and layoffs were on the table. Sun, Sep 6, 2009 : 5:19 a.m. If they are not moving untill january those folks who hang out at the shelter or at st andrews breakfast have a place to stay!!!! !